With more than a decade in public relations, Todd Myers’ experience combines planning and implementing public relations strategies for sports franchises, producing award-winning public events, managing successful statewide political campaigns, building strong grassroots coalitions, and creating innovative Internet marketing solutions. 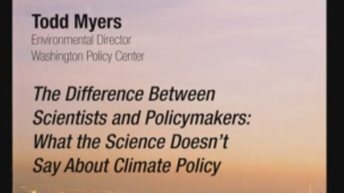 Myers is environmental director at the Washington Policy Center, a market-oriented think tank in Seattle. His areas of expertise include forestry policy, market approaches to climate change and the interplay between science and policy. He also runs a public relations firm whose clients include the Seattle Mariners, Pharmaceutical Research and Manufacturers of America (PhRMA), and Treehouse (a nonprofit organization improving the lives of foster children). From 1997 through 2000, Myers was director of public relations for the Seattle SuperSonics, helping them work through playoff years as well as the 1997 NBA lockout. During that time he developed the NBA’s best Internet marketing programs, including the first e-mail newsletters and in-game, interactive programs. Myers also served as director of public relations for the Seattle Mariners during the effort to create Seattle’s new ballpark.